You know that household. The one where they make you take your shoes off at the door. The one with the basket at the front door where you’re required to make a shoe deposit. The one where you’re expected to socialize in your stockinged feet. Annoying, right? Well, maybe they know something you don’t about wearing shoes in the house. Here’s why it’s a good idea to never wear shoes at home. Are you grossed out yet? We are. A collaborative study done by researchers from the University of Antwerp, the University of Gent and the University of Liverpool proved long-held theories that footwear negatively alters the natural form and function of the feet. The longer you wear shoes, the more misshapen your feet tend to be. Over time, secondary, related issues can arise, such as knee and back pain. All because you refused to go barefoot in the house. Tsk, tsk. Almost everyone is looking for ways to reduce the amount of time spent cleaning the home. You probably already use cleaning tips and tricks to make cleaning less of a chore. One of the most obvious ways to reduce your cleaning time is to prevent dirt in the first place. If you instigate a “no shoes in the house” policy, you’ll notice your floors are a lot less dirty, and require a lot less cleaning. You are very welcome. If you or your friends have youngsters who play on the floors in your home, that’s all the more reason to never wear shoes at home. Youngsters are much more susceptible to germs and bacteria because their immune system hasn’t yet built up. If you can make the home’s floors cleaner and safer for the young children in your life, doesn’t it make sense to do so? Now, you probably don’t want your family and friends to leave their shoes in a big heap by the door. Here are some pleasing yet practical solutions for storing shoes by the door. A shoe tree is a circular, vertical metal stand with a very small “footprint” (no pun intended). This is a practical option if you have a small living space. Shoe shelves take up a lot of space, so they will work best if you have a dedicated foyer. If you have an entryway coat closet, you could easily hang one of these over-the-door shoe organizers inside for guests and family to use. Hall trees provide much more than just shoe storage. They typically have coat hooks, a seating bench, and one or more drawers to store shoes. As you can see, there are lots of smart reasons why you should never wear shoes in the house, as well as practical ways to store shoes by the door. 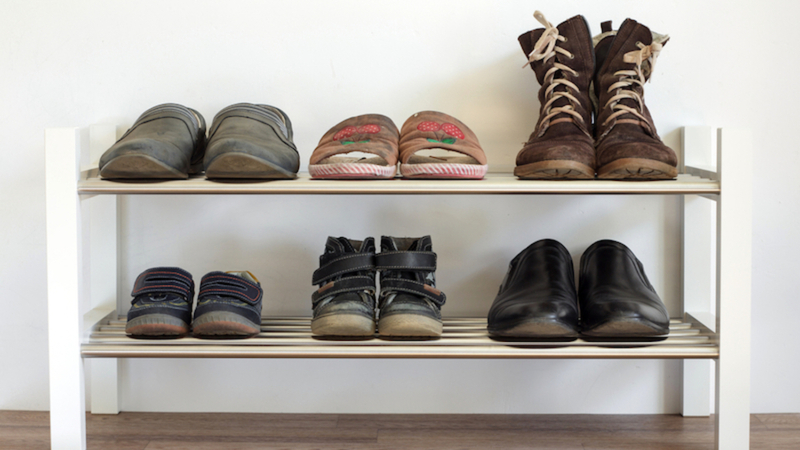 Please comment below if you have more ideas about keeping shoes neat and tidy by the entryway.